A devotee who offers sacrifices through Yangya worship etc., to Vishnu, the one who existed before the creation, one who created everything, one who is every moment new, who is Lord of all majesties, or a devotee who describes the incarnations of Lord, like that of Krishna, which is the greatest, he alone will be happy and full of renown, and at the end of his life will quickly attain the abode which is to be attained in the end - Thy abode. O you poets, who sing the praise of the kings women etc., in whatever way you know, sing the praise of the Lord who is clear essence of all the Vedas, narrating His deeds in various incarnations. Understand that the chanting of His names confers limitless happiness, and so chant them whole heartedly. O Lord Vishnu! by chanting the names of Thee The Great, I will attain the knowledge of the Truth. One should always meditate on the great deeds of Lord Mahaa Vishnu, by which He established righteousness, and by which He helped Indra sometimes as a servant, and some times as a friend, bringing welfare to him and to the whole world. The Lord's supreme state and well illumined Pure Consciousness is experienced by Yogis and Siddhas. Whose greatness great holy men and scholars try to expound by composing many hymns of praise. Those born and those being born now, have not understood Thy limitless majesty and glory. O Lord! Knowing that the chanting of Thy names is welfare promoting, I will every moment chant Thy names. O Vishnu! I will praise Thee by various different hymns invoking Thee who do reside in the Vaikunthaloka which shines transcending the three worlds. O Lord of the Universe! At first, at the beginning of the creation water came into existence and held Thee into themselves. O Lord Reclining on the Waters! All the jeevas then were merged and held in Thy being. On Thee the Birthless Lord! There rose one lone lotus from Thy naval with eight petals representing the eight quarters and the golden mountain (Mahaameru) as its pericarp representing all the worlds. O men! 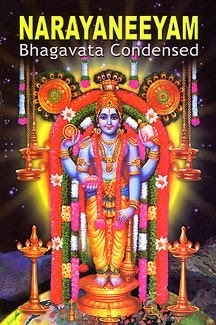 You all do not know that Vishnu is the creator of this world. You also do not know that he resides in a subtle form within you. With your minds covered with the mist of Maayaa, you are infatuated by names and shapes, performing sacrifices with the aim of living a life deeming sense satisfaction the sole meaning of life. Alas! you do not covet Mukunda (Krishna). O Supreme Being! Thou do have thousands of heads eyes and feet which fill the whole world, yet transcending it all, Thou do reside in the limited cavity of the inner most heart of beings. Thou are everything in the past future and now. Besides, what more, though Thou have entered the body senses etc., Thou alone transcend all this and enjoy the bliss of the liberation nectar. O Infinite Being! Having taken on the form of the three worlds, Thou do transcend all that. Thou remain the Eternal Pure Knowledge Conciousness. What more, Thy greatness is so great that only a small part of it is seen as encompassing the whole world. The major three fourth part is intense bliss bearing, and shines above and beyond all. To That Thee salutations. Thy unmanifested formless Being (Nirguna) is very difficult to grasp, whereas Thy form of pure Satva (Saguna) can easily be grasped. This form is clear and is like a wave on the ocean of liberation nectar. It is the most superior dear and lovable, with its attributes and qualities attracting the mind. To That Thy idol form I resort to. O Lord of Guruvaayur! Shri Krishna! save me from all diseases.